Color Club Overboard with Dollish Polish I'm A Material Girl accent nail. 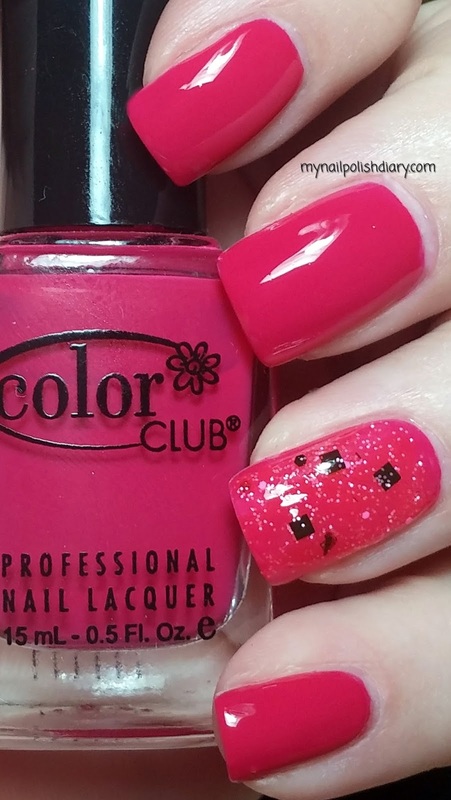 Color Club Overboard, 2008 Yacht Collection, is kind of a "crelly". Which is to say it's a cream that looks squishy and super shiny like a jelly does, but with pigment like a creme. I absolutely love this shade of pink. It's probably my favorite shade to wear. And also why I have many dupes. OPI Koala Bear-Y, China Glaze Fuchsia Fanatic just to name a couple off the top of my head. Love the way this color works with my skin tone. And it's just so dang pretty. 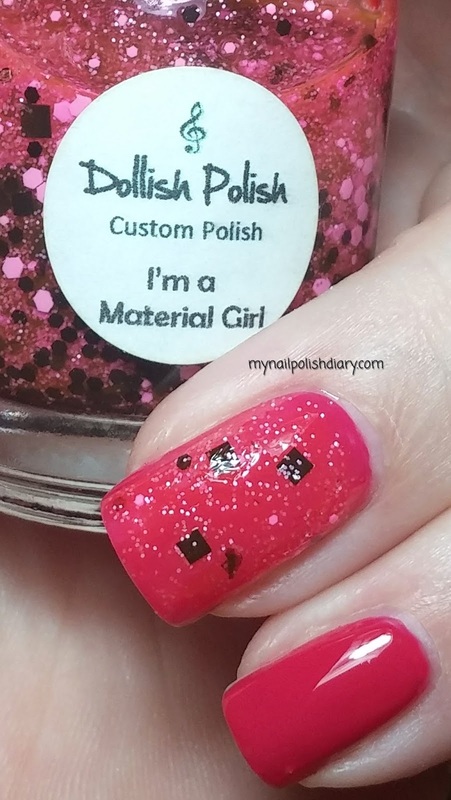 Dollish Polish I'm A Material Girl, 2012 Music Series, is an indie. I had to wait a good while before I was able to add this to my collection. Indies are quickly sold out most of the time. I got lucky with this one though and found it in a blog sale. Happy to have it in my collection finally. It's a bit thick. I had to blob the polish on my nail and then move it around with an orange wood stick to get the glitter where I wanted it. I also had to fish some out to get all that I wanted onto the nail. Since I usually only add glitter to accent nails I don't mind the trouble at all. The payoff is well worth it. Super cute and fun. All in all I was really happy how this mani turned out. You got I'm A Material Girl! That one's one of my biggest lemmings. I've heard it's a glitter of the worst kind, but it is, like you said, so darned cute! You should grab it if you can Liesl!